Responsible stewardship of critical freshwater resources and water quality inspire KISTERS to continually innovate its software and IT solutions to provide decision-makers with efficient access to information of the highest quality and long-term security. North of the Great Lakes in Canada, local conservation authorities are responsible for protecting and managing impacts on water and other natural resources. As agencies measure water flows and levels, they’re also tracking effects on communities and ecosystems in the province of Ontario. Extensive recordkeeping means new abilities to perform taxonomic tracking and standardize sampling methodologies. Integrating hydrological time-series with biological observations enables faster biotic index calculations, more reliable assessments, and deeper evaluations of biodiversity. Hidroeléctrica de Cahora Bassa S. A., the majority shareholder of the Cahora Bassa Dam has installed KISTERS’ software to efficiently manage water data to operate the largest hydroelectric power plant in southern Africa and manage a 63,000 GL reservoir. With a generating capacity of 2,060 MW, Mozambique’s HCB distributes energy to neighboring South Africa and Zimbabwe. In Switzerland, hail is the second most expensive natural hazard after flooding. 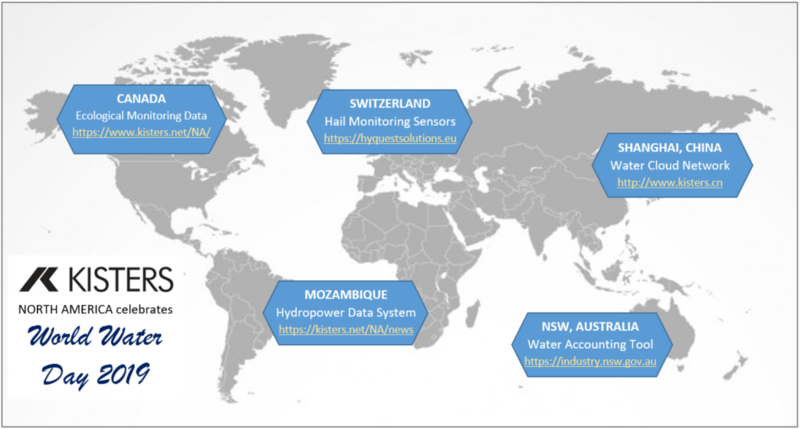 For the first time, The Swiss Hail Network is recording the kinetic energy, grain size, and precise time of impact of hail during storms using new sensors. Up to 80 HailSens units are being installed in regions with the highest probability of hailstorms. Combined with weather radar data and publicly reported observations, real-time data collected by the automated hail measuring network will be used to reduce damage and develop early warning systems. Information will be incorporated into ongoing research by Swiss Mobiliar Lab for Natural Risks at the University of Bern and MeteoSwiss, the Federal Office for Meteorology and Climatology. The monitoring innovation was developed by htw saar, inNet Monitoring AG, dimeto GmbH and KISTERS AG / HyQuest Solutions Pty Ltd. In China, the flexibility of KISTERS technologies is powering collaboration between local authorities. Environmental Protection & City Management of Pudong New Area and Shanghai Water Authority have established a water data hub. The combined Pudong Water Cloud Network collects, validates and processes data from a thousand hydrological stations and double the number of water quality locations. The shared surface water quality system averages 400,000 imports; 700,000 calculation requests; and 130,000 PV day. Australian water authorities are required to produce annual General Purpose Water Accounting Reports, or summaries of available water resources and their management. The Bureau of Meteorology in 2010 set forth standards for water resources accounting, which differs from water usage accounting and invoicing. The Government of New South Wales, Department of Primary Industries (formerly the Office of Water) and KISTERS developed a Water Resource Accounting tool that estimates water resources, availability and usage with constraints such as water rights, trading, extraction and recovery for maximum public benefit. The central data repository, web-based app and statement generator have been designed to provide the highest level of confidence in the reported information.